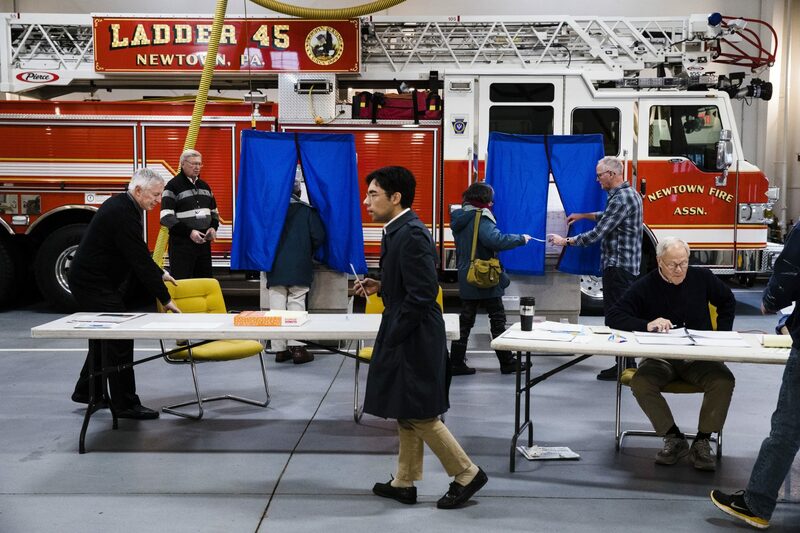 Voters cast their ballots at a fire station in Newtown, Pa., Tuesday, Nov. 6, 2018. Thompson has covered state government for The Patriot since 1999. Prior to that, he had covered various Cumberland County municipalities and school districts. Thompson lives in Carlisle with his wife, Beth, and their two children. Republicans in Pennsylvania are coming off a rough mid-term election cycle in 2018, and they showed no signs of breaking the Democratic Party’s momentum in a special election for a western Pennsylvania state Senate race last week. All of which, to listen to the conservative activists populating the 2019 PA Leadership Conference, which bills itself as the Keystone State’s version of the national Conservative Political Action Conference, means next to nothing. Buoyed by early reports on Special Counsel Robert Mueller’s investigation; President Donald Trump’s stolid support for top conservative action items; and mostly strong national economic performance over the last two years, conference attendees said they see a clear path to a repeat Trump win in Pennsylvania in 2020. And, in a group where many had other first choices in 2016, they’re fine with that. “I thought for sure that he (Trump) was going to be a Mike Bloomberg, center-left person in governance, when in fact he has delivered on all of the things that are most important to the conservative base,” said David Taylor, president and CEO of the Pennsylvania Manufacturers Association. Taylor noted he left his ballot for president blank in 2016 precisely because of those concerns. He will be a Trump pick-up next year, he said. That kind of Trump love was echoed often here Saturday, in a speech-a-palooza that drew about 600 registrants from 41 counties across the state. Take Lois Kaneshiki, a Duncansville resident who is president of the Blair County Republican Women and was, initially, a Cruz supporter in 2016. “I think most of us are fully supportive of the president who maybe initially weren’t, but it was like: ‘Well, we gotta get on the Trump train now because he’s the nominee.’ And, you know, we did… But we’ve been very happy to see a lot of the things he’s gotten done. So if Trump retains a strong hold on the conservative base, that’s half the battle. But what about the fight for the American center that so often defines the nation’s political tides? It’s not all rosy for Trump, according to a recent Franklin & Marshall College poll of the state, in which nearly half of respondents who registered firm opinions about the president’s job performance to date said they will vote against him in 2020 no matter who the Democratic nominee is. On the other hand, pollster G. Terry Madonna noted, Trump’s current job performance approval rating is right where former President Barack Obama’s rested at this point in his first term. Obama went on to win Pennsylvania in his re-election by more than 5 percentage points. Saturday’s keynote speaker, national political reporter Salena Zito whose focus on covering rural and small town America attracted lots of notice for her early reading of a populist revolution in 2016, said her work tells her that it’s so far, so good for the president. Zito said she comes to her conclusion in part based on her reading of the U.S. Senate results in 2018 – statewide races that mirror the battle for electoral college votes in a presidential race, and in which the GOP increased its majority by two seats. “Does the Trump coalition stay together? It does,” Zito said, adding later that “If the election was held today, he (Trump) would win. As he says, bigly…. There are lots of things that could change the current dynamic, of course, including a major downturn in an economy that Trump will own more than most presidents because of the 2017 tax cuts, his aggressive trade policies and regulatory reforms. The other big wild card, of course, is who is the opponent? Here, many of the conservatives said they were watching the early pre-primary jockeying by Democratic hopefuls with a great deal of interest, and open hope that the Democrats will – in their world-view – get it wrong. “You have such overt socialism among some of the (Democratic) candidates now, that I think many people find appalling,” said Al Bienstock, 78, and a longtime GOP activist in Cumberland County. Some, like Blair County’s Kaneshiki, noted it’s important that down-ballot candidates in state Senate and House do the things they need to do to win in their own backyards, too. One of the strongest calls to arms Saturday came from U.S. Rep. Scott Perry, R-York County, who implored his audience – in an age in which Zito noted 24 percent of the Trump supporters she’d talked to never voiced their leanings to any friends or family members – to be proud and loud in their views. Perry said people come up to him frequently and ask in whispering tones how he thinks the Republicans can do with Trump at the top of the ticket. PennLive and The Patriot-News are partners with PA Post. Boko Haram stalled her education. Five years later, she’s starting over in central Pa.